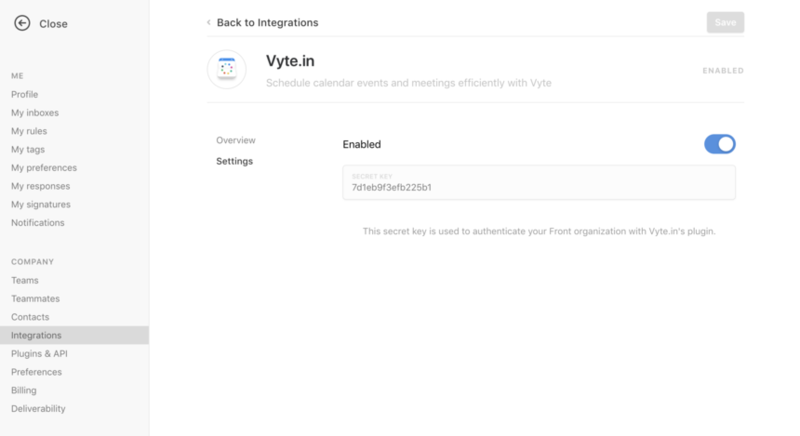 Like other integrations, you need to be an admin in order to set up the Vyte integration. 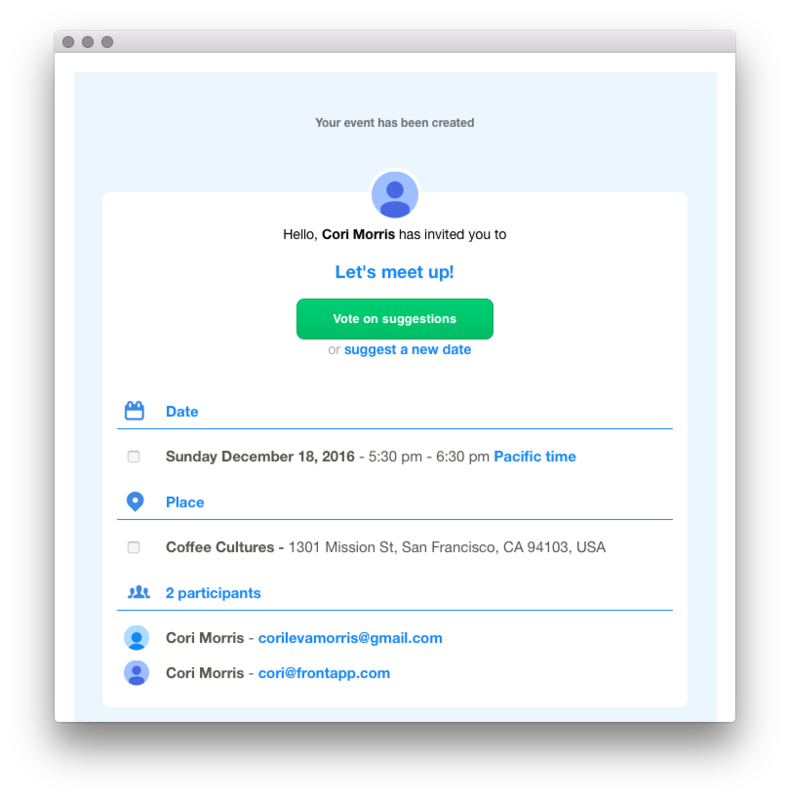 Vyte allows you to quickly schedule meetings. Choose the best time and place, and send the invitation. Everyone will get a confirmation on their calendars. Go into your Front Settings, select Integrations, and choose Vyte.in from the list. Click Enable Integration, toggle the switch on, and click Save. 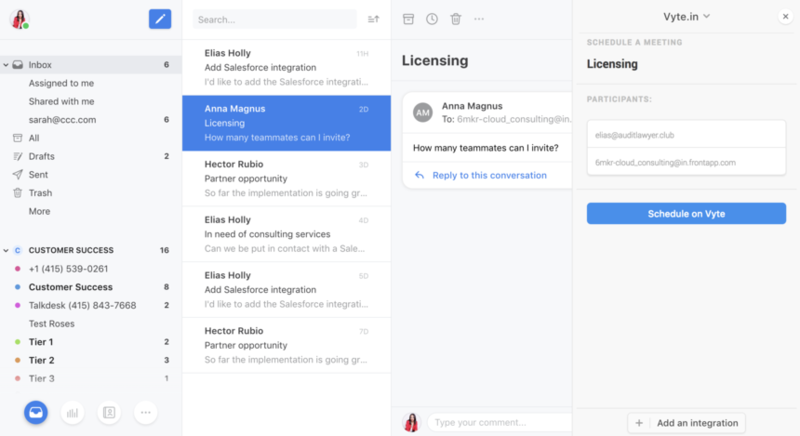 Go back to your inbox view, and choose Vyte.in from the dropdown in your integrations panel. You will be redirected to the Vyte website. Click Login with Google. Currently, you need a Google account to use Vyte. If you don't have a Google account, click Not using Google to tell them what mail and calendar provider you are using. They will let you know when Vyte expands. Select the Google account you want to use, and click Allow. Create your event. Suggest a time and place, add a message, and click Send this event. You will then receive an email with the invite. Click Vote on suggestions, and confirm the event! The meeting should now appear on your calendar.